The one I go to the most, is the one in Somerset House on the Strand but they have other spots in Mayfair, Soho and Exhibition Road in South Kensington. 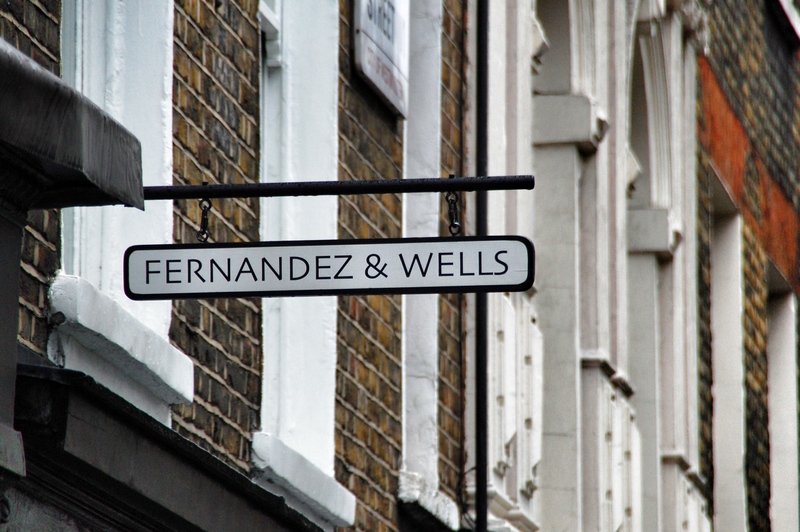 I read a recent article about the chaps behind Fernandez and Wells and I didn’t realise how long they’ve been in the game. Considering the length of time and their popularity, you would have expected them to have more spots across town but it seems these guys are still very much independent and invested in keeping the original vision of their cafe alive. So they are particular about both their space and the food and drink they provide, which means they won’t just open up in any old venue going. The look and feel is similar across their different shops and is very much stripped back and bare, decorated with gourmet sandwiches sitting atop thick wooden blocks.This seems a stock look for most indie cafes these days but it’s worth remembering this aesthetic was pretty fresh and different when Fernandez and Wells opened 10 years ago. Every thing I’ve had here from savoury to sweet bits has been pretty good. The sandwiches are decent and the cakes feel like calories well spent. They also offer apparently a very good wine selection and have cured meats and cheese, so I guess one could come here as an alternative to a wine bar, especially the ones in Denmark St, Lexington St and Exhibition Road, which are open till 11pm most day. I’ve never actually sat down in a Fernandez and Wells – it’s always been a grab and go situation, which is not to imply they don’t provide a nice environment to sit in and have something to eat, because they do. £15 should sort you out for a sarnie, cake and a drink. One of the old school hip indie cafes that is still relevant today, serving up yummy savoury and sweet things.